For our office election watch party last night, we wanted to watch results on as many simultaneous races as we could but we were particularly interested in the locals. That's because we knew the national races would be covered heavily and we had a projector set up for TV coverage, but the local races would be more difficult to follow without a lot of channel flipping. At the same time, we also knew we weren't going to come up with some sort of hologram-Wolf-Blitzer-projected-on-a-touch-screen-ice-rink level visualization in just a couple of hours. We could build something fun, responsive, and autonomous though. To get it done quickly I'd need to channel my past in the newspaper industry and remember that doing it "right" wasn't worth much of anything if it wouldn't be done until it was two days too late. I was interested in two sets of races: The Arkansas state referendum, and the major City of Fayetteville races (4 city council alderman races and one mayoral race). Not bad. Bootstrap definitely gives us a lot of CSS selectors to work with. There's a lot of whitespace around the candidate names, but that can be dealt with. The race title, at least in some cases, is split between two <h4 class="card-title"> tags which will also need to be reconciled. Not shown in this markup is the way individual counties and cities are labeled in this data, but they were h3 and h4 tags, respectively, that were siblings to these <div class="elections-race"> divs. That would be harder to sort out--we'd have to walk back through the nearest preceding sibling elements to find the relevant municipality. This markup was a bit more structured, so there wouldn't be much trouble ingesting it. Scrapy is a handy Python framework for building web crawlers and parsing HTML content. Now, Scrapy was probably overkill for what we needed since we were just parsing a couple of single page targets. As a framework, Scrapy is geared towards building spiders: bots that crawl webpages across links and build very robust pipelines of data. That said, it's a breeze to install and comes with enough syntactic bells and whistles that it was worth using, even if we only used about 1% what it is capable of. This starts a script project in the current directory called "elx". These of course don't do anything but return an empty list, but each one pulls down the appropriate page and is ready for parsing. 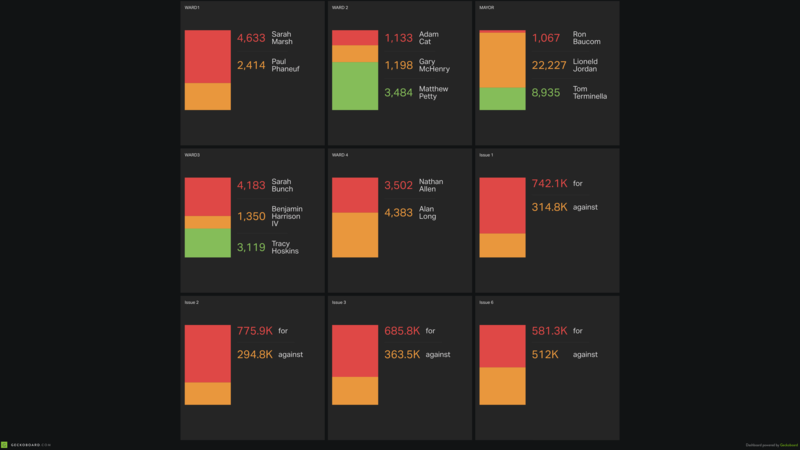 We decided on Geckoboard as the best option for quickly visualizing our data. It could pull sources over the web, we already had an account there, and it looks pretty decent. That didn't quite fit what we had scraped, but we did what any programmer with minutes left on a deadline would do. We hacked and repeated a bunch of code! Each Spider above was turned into a Pythonic base class with some sort of filtering in the parse method (only yield results if the race matches a certain title, etc) and created individual spiders for each race. Luckily, switching scrapy's output to CSV was painless--it can be done through a project setting, or by simply specifying a .csv extension in your output file. Now we had data being pulled to my laptop every 5 minutes--we just needed to get it web accessible for GeckoBoard to ingest it. Ngrok is a neat tool that sets up a dynamic proxy to a local port. You receive a dynamic DNS name at *.ngrok.com which can make local device temporarily web accessible. We ngrok all the time to demo local web applications to our team and clients before a product is in the cloud. Today though, I just needed to serve some static files to Geckoboard over HTTP. Equally handy, Python ships with a lightweight (albeit not terribly efficient) web server module. We'll let Python serve the files and ask ngrok to proxy the local web server so Geckoboard can see it. And that's everything we needed to serve the data up for Geckoboard. We were pretty happy with how it turned out and it was nice to get some fancy local results alongside the national coverage during our watch party (even if things didn't exactly go the way we had hoped, ahem). Of course, there are many other ways to accomplish the same thing--some far more robust and stable. Perhaps closer to real time if you have access to the correct data sources. In all, though, we were pretty happy with what could be accomplished in just a couple of hours of relatively low effort.